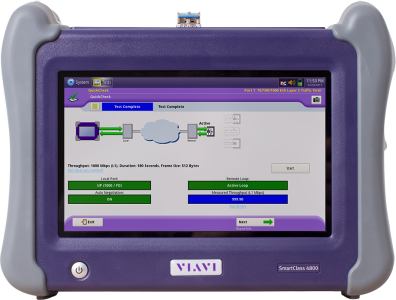 With the ability to test electrical and optical Ethernet links as well T1 and E1 interfaces, the SmartClass 4800 allows technicians to test all common business class interfaces. Technicians can test the quality of voice services regardless of whether they are delivered via VoIP or PRI. The industry’s smallest handheld instrument can test throughout the service life cycle, including service activation, troubleshooting, and maintenance. Advanced Ethernet test features such as TrueSpeed per RFC 6349 and, J-Profiler help field technicians test their networks faster and more accurately than ever before.